* What is the difference between a Curriculum Vitae (CV) and a Resume? The primary difference between a resume and a curriculum vitae (CV) is the length, what is included and what each is used for. A resume is a one or two page summary of your skills, experience and education. While a resume is brief and concise - no more than a page or two, a Curriculum Vitae is a longer (at least two pages) and more detailed synopsis. * When should job seekers use a Curriculum Vitae, commonly referred to as CV, rather than a Resume? When asking for a job in Europe, the Middle East, Africa, or Asia, expect to submit a CV rather than a resume. Keep in mind that overseas employers often expect to read the type of personal information on a curriculum vitae that would never be included on an American resume, such as date of birth, nationality and place of birth. United States law on what information job applicants can be asked to provide does not apply outside the country. * Do you write international Resumes and CVs? We write Resumes and CVs for all jobseekers in USA, Canada, UK and all countries in Asia, especially India. * How important is a Resume/CV? Companies and recruitment firms receive hundreds of Resumes/CV's for each and every job opening. However, only a few are short listed for the interview. This short listing is done initially on the basis of your resume. On average a Resume/Curriculum Vitae will receive not more than 30 seconds initial consideration. In that short time it must make an impact. In order to get someone to look at it longer, it must quickly and effectively convey your capabilities, competence and 'strengths'. So don't just leave it to chance. Order Your Professional Resume/CV Now! * I am thinking of writing my Resume/CV on my own. Would it be a good idea? It would surely be a good idea if you know what you are doing or want to save some money. But, would you like to gamble with you career? Writing a Professional Resume/CV is not that simple as it seems. With years of experience behind us, we have become experts in this field. You can allow us to do the job for you at very reasonable rates. * Do I need Professional Resume/CV Writing Services? A Resume or Curriculum Vitae is the face of a candidate appearing for any job. This piece of paper has so much value that it can either push you to the top or drag you down. So, it is better to get professional help in preparing a resume, whether it is for your first job, or for subsequent jobs. * How long will it take to create my Resume/CV? After having received all your details, it would take us only between 3 to 5 business days to create a Professional Resume/CV, depending upon our workload. * What if I am not satisfied with the Resume/CV? After a CV is processed, an email with the "final" draft of the Resume/CV is sent to you along with our contact phone number. If you are not satisfied with Resume/CV, you can email us the changes or modifications that you would like to have in the Resume/CV. or speak directly in person or on phone. The changes that you request for shall be incorporated in to your Resume/CV and its final version shall be emailed to you. Check out our 30 day guarantee. * How much will my Resume/CV cost? 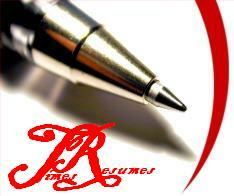 We provide quality Resume/CV writing services at realistic and affordable prices. We do this by keeping our costs to a minimum and concentrating our resources on the customer. To know about our prices go to the "Order Page". * I have a Resume/CV but can you help me with the covering letter? Any Resume/CV is incomplete without a Covering Letter. Employers look at the Cover Letter and decide whether to take a look at the CV or not. Allow our Professional Resume/CV Writers to do the job for you. * How long does the process of posting my Resume/CV to all the top 10 job sites on the internet take? Resume/CV Distribution Services, includes, opening of your free account on the top 10 job sites on the internet and posting your Resume/CV there. We shall send you an email confirmation including your complete login details to all 10 job sites. Internet Resume Posting will be done within 2 days of delivery of your resume if ordered together. If this service is ordered separately Internet Resume Posting will be done within 2 days of receipt of payment. However, after we have posted your Resume/CV, it may take up to 48+ hours for the process to be completed and for you to see your information up on all 10 job sites. use. * How can I order and pay for more than one of your services online? To ensure the highest level of security, all online payments are accepted by us through the world's most trusted and secure payment gateway PayPal. Just go to the "Order Page". Order your Resume/CV (depending on your level of experience) by clicking on the "Add to Cart" PayPal button. You will then be taken to the "PayPal" page where you will find the details of your purchase (one item) in your Shopping Cart. Now if you want Express delivery of your Resume (urgent delivery in 2 business days instead of 5 business days), just click the "Continue Shopping" button in your Shopping Cart and you will be taken back to the "Order Page". Now order your Express Resume, by clicking on the relevant "Add to Cart" PayPal button. You will then be taken to your Shopping Cart where you will find the details of your purchase (two items). Now if you want to order a cover letter also, just click the "Continue Shopping" button in your Shopping Cart and you will be taken back to the "Order Page". Now order your Cover letter by clicking on the relevant "Add to Cart" PayPal button. You will again be taken to your Shopping Cart where you will find the details of your purchase (three items). In this manner you can add many services to your in your Shopping Cart. After you have checked the "total payment" details in your Shopping Cart, click on the "Check Out" button. On the next page you have the option to pay with your PayPal balance (if you have an existing PayPal account) or you can pay with your credit card. * What Other Payment Methods can I use? To know about our prices and Payment Options, Click Here! and go to the "Order Page". * How can I get answers to questions not listed here? If your have any questions please Contact Us on phone or email.